HP is readying two new Android tablets with a focus on the business world: the HP Pro Slate 12 and HP Pro Slate 8. The 12 has a 12.3-inch 1600 x 1200 display and 32GB of storage, while the Pro Slate 8 has a 7.7-inch 2048 x 1536 display and 16GB. Both feature Snapdragon 801 chips, 2GB of memory, Android 4.4 KitKat, microSD and nanoSIM support, and front and rear cameras, plus Bluetooth, NFC, and a microUSB port with HDMI-out capabilities via an adapter. The new HP tablets are also compatible with the HP Duet pen, an ultrasonic stylus that transcribes your scribblings to the tablet screen no matter what surface you're actually writing on. Note that the new HP Pro Slate 8 is apparently different from the HP Slate 8 Pro that launched earlier this year. However although the HP Pro Slate 12 has a home on HP's website, its smaller sibling is missing - even though, according to Liliputing, it was up there at one point. 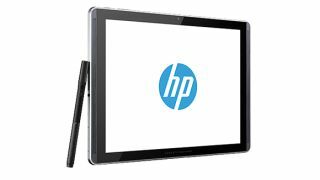 We've asked HP to clarify why the Pro Slate 8's listing was taken down, as well as further details like pricing and release date. We'll update if we hear back.